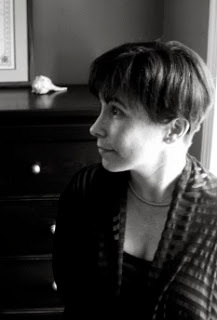 Today, please welcome SF/F writer Fran Wilde to the blog! I met Fran at Taos Toolbox and was impressed by her ability to fuse lyrical writing with genre fiction. She became a full SFWA member in July 2012 and scored an agent (!) in May 2013, and I’ve asked her here to share a bit more about herself and her writing journey. Please tell us about your journey from when you first decided you wanted to be a writer through now. I was a writer the moment I realized you could make words stick around by writing them down. Mine is a storytelling family (some relatives use circular breathing so they can’t be interrupted; others tell fantastic yarns that end with ‘Whelp. So that happened.’). I grew up listening to their stories – some of which changed each time they were told. When I wrote my stories down, they stayed put. I liked that. And more than anything, I was a reader. I got my own library card as soon as possible, and I was on a first-name basis with the local indie bookstore owners. I read everything I could, especially if it had spaceships, universe-sized intrigues, computers, fantastic creatures, strange people, or, better, all of the above. Some of what I read wasn’t viewed as appropriate reading for me – I got told that a lot. I read it and loved it anyway. Two years after I completed my MFA, I set aside the manuscript I was working on in order to focus on three things that paid the bills: teaching, copywriting (mostly for engineers and tech), and programming. While I wrote during that time, I didn’t send anything out, and I didn’t have a community of writers, save for a few dear friends who kept reminding me who I was. Finally, one day I snapped and wrote half a story – and the next day I wrote some more, and soon I was back on a regular writing schedule. And this time around, I gave myself full permission to write what I wanted to write. No big shock, then, that my new stories had space in them. And programming, and engineering. And poetry. And strange creatures. I found a resource online –the SFF Online Writing Workshop – and critiqued there for a while before dropping a story in to see what would happen. That led to finding my first crit buddies – several of whom I still exchange work with. Five months later, I went to Viable Paradise and Jim MacDonald and the instructors at the Martha’s Vineyard workshop told me I wasn’t really a short story writer. They dared me to try to write a novel in 90 days. And I met more of my community. That was fantastic. A similar thing happened at Taos – where I met you! And I’m a better writer for it all. You have both a Masters in information architecture and interaction design and an MFA in poetry, which are very different fields. How does this background inform your writing? Programming and poetry share more in common than you might think. I’d love to see a poem written in regular expressions that actually compiles into something. I love the places where the two meet: interactive narratives, using hypertext and gorgeous graphics. I love graphic novels too. And I’m very aware of sensory stuff – particularly the sounds words make – sometimes too much so. I get caught up in nets of sound. What piece of writing advice has been key to bettering your craft? Easy is the enemy. Keep writing, every day. Put that amazing draft away for six weeks, then look at it again, with a critical eye. I had the good fortune of reading the amazing novel that got you agented. Please share a bit about the book and what you’re working on now. Bone Arrow is a science-fantasy YA novel that demanded to be written. I love building worlds, and this one’s a lot of fun, and strange, too. Think Cirque du Soleil meets the Codex Seraphinianus. But what I love best is the characters – because once I gave them the space, they ran with it. I had all these things planned out for them and instead, they did their own things, a lot of which completely surprised me. Right now, I’m working on a second generation story set in the same world, with different characters. There’s a related short story coming out in the Impossible Futuresanthology in August, called “A Moment of Gravity, Circumscribed”. And I’m working on a novella set in a different universe, and revisions to my first novel, Moonmaker, which is more tech-driven. I usually keep a lot of projects going so that if one slows down or I need to stick it in a drawer, I can pick up another. What is important for a beginning or intermediate writer to understand about writing for publication? Another good idea is to volunteer to read slush for a magazine in your genre. Keep an eye on your favorites via Twitter and Facebook. Editors sometimes post requests for new slush readers there. Once you see the scope of a typical slush pile, you’ll realize it’s not personal. And hopefully that will help you start to feel more confident about your writing and your submissions as well. Thank you Lauren! It’s always great to talk with you!